We are surrounded by stationery: half-chewed Cristal Bics and bent paper clips, rubber bands to fiddle with or ping, blunt pencils, rubbers and Tipp-ex are integral parts of our everyday environment. So much so that we never think about where they come from, why they are the way they are - or what stories they might have to tell. But luckily, James Ward does and he's here to tell you all about the secret pull stationery exerts on our lives. After all, who remains unmoved by the sight of a pristine blu-tak slab, or the first unmarked sheet of a brand new notepad? And which of humanity's brightest ideas didn't start life on a scrap of paper, a Post-it, or in the margins of a notebook? 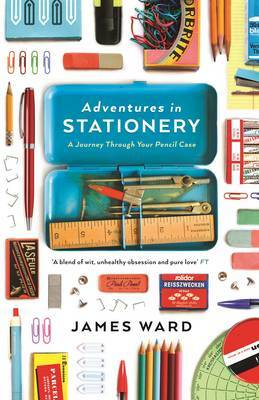 Exploring the stories behind these everyday objects, Ward reveals tales of invention - accidental and brilliant - and bitter rivalry. He also asks the questions you never thought you had: Who is Mr Pritt? What does shatter-proof resistant mean? How many pens does Argos use? And what does design evolutions in desk organisers mean for society? This witty and entertaining book, packed with fascinating facts, will change the way you look at your desk, pencil case or stationery cupboard forever.